Sayaji Baug Zoo at Vododara on the banks of the Vishwamitri river. The inspiration of a Zoo here came from H. H. Maharaja Sayajirao Gaekwad III and it was opened to the public in 1879. The Maharaja donated his own private collection of Indian and Exotic Animals to the Zoo. 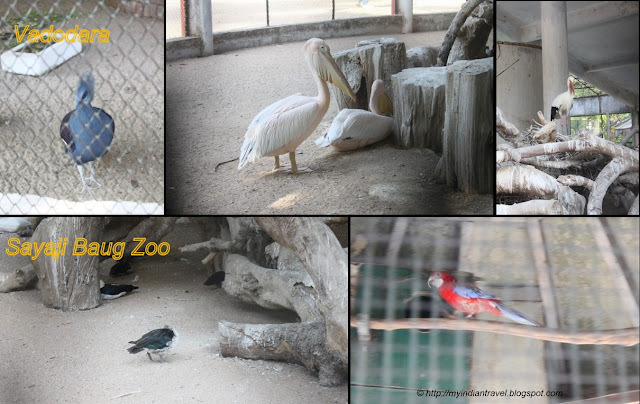 It has three sections a) Bird Section, b) Bear Section and c) Tiger section with more than 200 animals and 500 birds. Pretty variety of birds and photos. Happy Monday, enjoy your new week! Interesting looking birds. I find them very exotic from Finland's perspective. Have a nice week! Oh, I especially love that very first photo!! Have a happy week! Boa tarde, imagens perfeitas bem captadas, as mesmas revelam beleza, gostei de conhecer a sua pagina. What a wonderful Maharaja to conceive of this place and donate the animals...Happy New Year! How interesting to think that one person once owned all of these animals. Really interesting, very nice pictures. Ah one of my favorite animals....birds! How generous he was to share his wealth of animals and birds with everyone. Zoos are fascinating places in which to view animals one would not otherwise get to see. As long as they're well run and the animals are kept in good health and happiness, I do like them. I did ZOO a couple times in the past! Wonderful post for Z and great photos! Sound like a great place to visit. Beautiful birds! Thanks for sharing. Indeed some birds I have never seen ! Lovely birds. Happy New Year! I wonder if there are any descendants from the original animals. Great initiation to preserve birds and animals event at that period – where we hear most maharajas hunt animals to show their bravery, and this is really wonderful and nice knowing about this zoo. 137 years old, good to know about it. Is there any Tiger ? actually they rapid rate the Tigers are vanishing i think after five six years they can be found hardly.